This week is the beginning of our summer camps. We had nine camps scheduled, but were only able to fill six of them--still a pretty good turn out. This year I decided to do my camp early. I thought it would be nice since my children are still in school. So, today was the first day of Dinosaurs Everywhere. This camp is very popular with the boys. We take a total of 16 children in each camp. I have 14 boys and 2 girls. Of course, you know which dinosaur is the most popular don't you? If you said anything other than Tyrannosaurus Rex, you would be wrong. Think about it--14 boys emulating Tyrannosaurus Rex for a week--how does that sound? My solution, keep them as busy as I can. 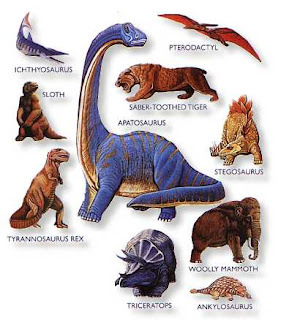 I began by pow-wowing with the children about what they already knew about dinosaurs. They know there are meat eaters and plant eaters, long necks, dinosaurs with horns, well, they are pretty well versed in the land of dinosaurs. 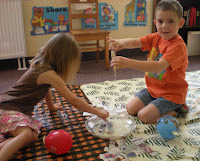 Our big project today was dinosaur eggs. This is a multiple day project, and pretty messy. The actual undertaking was much simpler than I had thought it would be though. 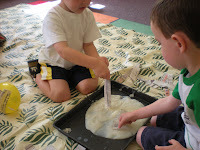 The first step was to make our glue. 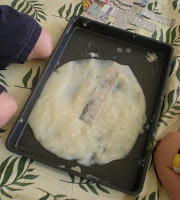 To do this we used a flour and water mixture I had read about. You know what, it worked great and had a super easy clean up. You mix one cup of flour with one cup of water. After that is mixed you stir in four cups of boiling water. Then you let it sit to cool. It makes a great glue. I actually doubled the recipe for the 16 children and I will have enough for tomorrow too. 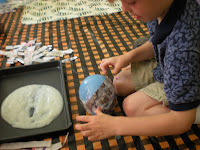 When I tried the project at home, I kept the "glue" in an airtight container so I could use it the next day. I can't really tell you how many days this will stay good though. The next step was to blow up small balloons with a dinosaur inside. I stuffed the dinosaur in the balloon first--with some help. We then blew up the balloons. Next you will need some newspaper torn into strips. I thought this could actually be something the children could do, but for time purposes I had newspaper strips already prepared. At home I had tried strips about 12 inches long, they were a little long. For school I prepared strips about 6 inches long, this worked better. Now the messy part. I spread vinyl table cloths on the floor and had three areas of glue and paper. I put the glue in a cookie sheet with some nice sides--it worked well. I had two children per sheet, so I did 6 children at a time. 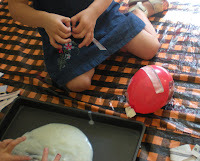 They put the strips in the glue and laid them on the balloon. Some covered the whole balloon, some got a few on. I did have one little boy that wanted NO part of touching that "stuff." Finally, I hung the eggs on an impromptu clothes line to dry. Let's keep our fingers crossed that they will dry by tomorrow. 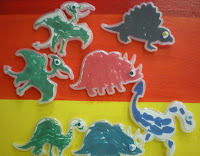 The other activity I had them do was make dinosaur pins. I had these left over from last years camp. I got them from Oriental Trading. The children colored the inside with markers and we added a wiggle eye. I think they are adorable. 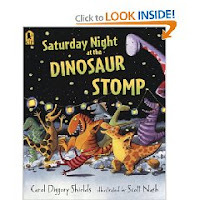 Our book we read was one of my favorites, "Saturday Night at the Dinosaur Stomp," by Carol Diggery Shields, illustrated by Scott Nash. I love the sing song rhyming and the fun verses. We all loved saying "Boom-a-lacka, Boom-a-lacka, Whack, Whack, Whack!" We finished our day running around outside. One of the best ways to end a day! What a fun day, and I can't wait to see what else you have planned. I'm going to have to check my library for that book -- it sounds great! Love the dinosaur eggs... how cute! Looks like they all had a lot of fun! What fun! and so cute! I recently went to a cub scout pack meeting where they used these dinosaur eggs to house the new patches the boys had earned, and the boys loved them! You are so creative.